Noir ensembles can be incredibly chic, but sometimes all black outfits can look uninspired or make you feel like a waitress. 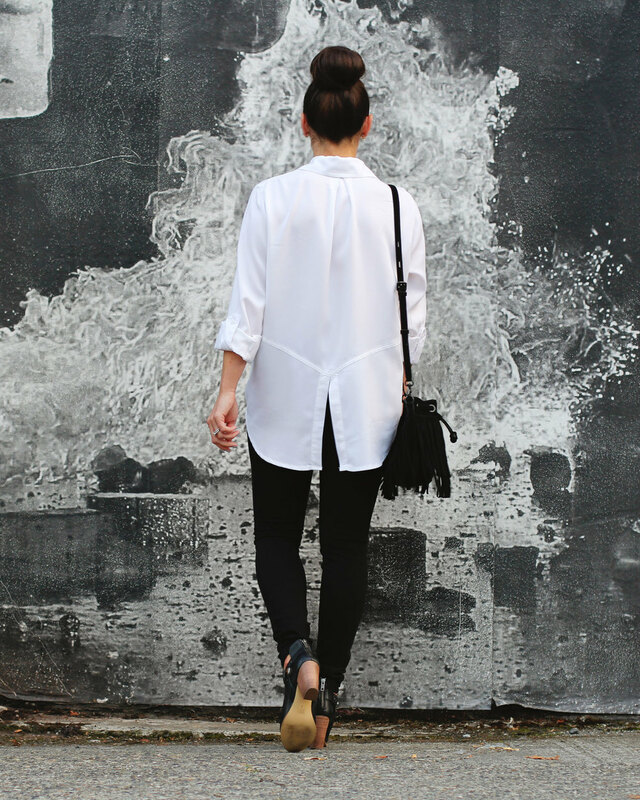 Today I'm sharing 4 easy style tips for wearing all black and looking anything but dull. I've also rounded up a handful of GORGEOUS tops that you'll be wearing over and over this fall (I even "accidentally" bought one while writing this post- whoops)! I love a basic piece that has an unexpected design element like this split back Sam Edelman shirt! It is still a crisp white top but the back gives it some added interest and takes it from boring to fabulous! The same goes for these amazing Seychelle boots that have the perfect heel height. Find more of my favorite fall booties in this post! I've been wanting some Stone Cold Fox clothing since they started years ago. The lace they use is absolutely stunning and it is made in the beautiful state of California. This dress is one that I will wear for years to come... if I don't wear it out before the summer ends! They also make amazing robes (perfect for bride/bridesmaid gifts)! Visit their site here!